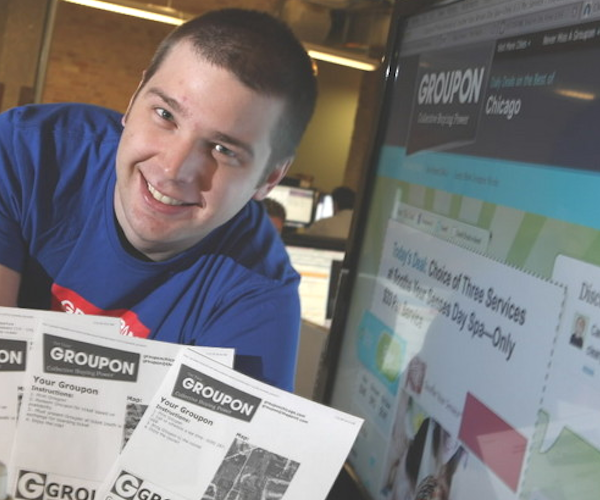 What you can learn from Groupon about building a successful business. I have no shame in proclaiming my absolute adoration of Groupon. I love everything about the company, from its business model, to its branding, marketing and everything in between. In my opinion I think its right up there with the big 3 in social media – Facebook, Twitter and Foursquare. Having a presence on groupon will be making its way into more and more social media marketing plans and it’s easy to see why. They’re responsible for some great case studies, such as Gap, which we covered last week. I want to go a little deeper into the actual business of Groupon and see what lessons can be learned for new businesses setting up. The business value of social media has been well and truly proven now, particularly with the rise in social commerce that we’re now witnessing. One of the smartest things you can do right now is to find a way to make social fit at the very centre of your business model. While established brands are forced to adopt social technologies to enhance their existing way of doing business, new brands have the benefit of making their business function around social completely. This is exactly what Groupon did with its group buying concept. It tied into the aspect of community so simplistically. If you want to get a great offer yourself, increase your chances by sharing the offer (and the brand) through your own social channels. It’s absolute genius. One of the most common downfalls of new businesses is to invest months and months in building a website, redesigning it, optimising it and adding more buttons. There is such a temptation to add on a load of functionality and widgets in the hope that this will increase your business. Groupon is so simple, and it proves the case that you don’t need a load of extra technology to create a product that people will buy into. On their site they just provide a few actions – receive deals by email, connect through Facebook, view latest deals and the option join their friend referral scheme. It’s an eyecatching site but it’s a tight user experience that importantly doesn’t require too much from the consumer to take part in the scheme. This may not be the same outside of Ireland, but if my own Facebook profile is anything to go by, Groupon are investing a lot in Facebook ads. I’m constantly seeing their ad for ‘one huge coupon emailed daily’ and it always gets my attention. By being such a visible brand I’m instantly interested in its site and inevitably trust them more as a business. Its also not afraid to work with big brands, which in turn creates significant marketing value and coverage for them, as these case studies get featured on tech and business sites around the world. What Groupon consistently do is to invest in the channels that are immediately tied to their business strategy of sharing. At the time of the Gap promotion, it purchased an ad spot on Digg to promote it, where the user is just one click away from sharing the coupon and obviously helping groupon get one step closer to the deal reaching the right amount of users to validate. While some may argue that Groupon’s concept isn’t all that new, you certainly can’t argue with the fact that its not afraid of growing quick and expanding into new markets. From July to August the site saw an increase in traffic of 23%, making it the fourth fastest growing web company and reportedly the fastest growing company ever. With this growth in traffic they’re grabbing on fast to the opportunities and growing out their office space. In May this year it opened an office in Silicon Valley, purchased the mobile development company mob.ly and hired Mark Johnson, former ad exec at Netflix. Ambitious moves for what was still a relatively new company and it shows they recognise the moves they need to grow into the market, when their concept is so easily to replicate. It also rapidly expanded the cities in which it operates, which is so central to their business success. It bought up Citydeal for their European operation and recently expanded into the Russian and Japanese markets, buying up Qpod and Darberry. This brings them up to 29 cities worldwide and they show no sign of slowing down. Such ambition is admirable and shows the speed with which you need to move in business today, particularly online, if you are to beat off competitors and actually sustain a profitable business. The fundamental reason why Groupon is so successful is because they took advantage of an untapped market need. The simple fact is that we all love a great deal. Coupons will always work but they hadn’t really expanded that much beyond being cut out of a magazine, with the odd exception of a Pizza Express email voucher. Groupon has taken advantage of a simple idea such as a coupon and found a way to make it cool, by making it social. This is the challenge for so many new businesses now, when you face stiff competition in an overloaded market. You have to find a way of making your product or service relevant to the market and turn something simple completely on its head with the use of social media. These are just a few of the lessons that can be learned from Groupon, and they’re an excellent example of how social media is giving rise to completely new business models and concepts.